Not that the University of Virginia football program needed any further motivation for its regular season finale at Virginia Tech, but the Cavaliers may have it a little bit more edge after falling to Georgia Tech, 30-27, in overtime. Saturday’s contest in Atlanta was a hard-fought one between both programs; however, the Virginia players must feel they let a win slip away. – The Cavalier defense held Georgia Tech’s triple option attack to 268 yards, 94 under its season average, and surrendered just one offensive touchdown the entire game. – Georgia Tech made it to the red zone four times, coming away with a touchdown, two field goals, and a turnover on downs. Special teams and missed opportunities ultimately cost the Cavaliers. It started in the first quarter when Juanyeh Thomas returned a Virginia free kick – the Yellow Jackets had just recorded a safety after sacking quarterback Bryce Perkins in the end zone — 77 yards for a touchdown. Tech quarterback TaQuon Marshall ran in the 2-point conversion to give the home team a 13-7 lead. In third quarter play, Virginia, now leading 21-16, held Georgia Tech to a 3-and-out on Tech’s second offensive series of the half. Punter Pressley Harvin III’s kick traveled 37 yards before bouncing up and hitting the back of Cavalier cornerback Darrius Bratton’s leg. Georgia Tech recovered at the Virginia 41, and the Yellow Jackets capitalized on the game’s lone turnover with a Jerry Howard 3-yard touchdown run 11 plays later. Another successful 2-point conversion put the Jackets up 24-21 early in the fourth quarter. In addition to the two big plays, Tech true freshman placekicker Wesley Wells booted four field goals, including a 48-yarder to give the home team the lead with 1:04 to go in regulation and a 40-yarder in overtime. The latter proved to be the game-winner when Virginia placekicker Brian Delaney, who kicked two game-tying field goals in the fourth quarter, badly pulled a 35-yard game-tying attempt in overtime. In the end, this was a terrifically contested game that included five first-half lead changes and neither team possessing a lead of over six points. Perkins played great once again, although he and the rest of Cavalier nation endured a major scare when he went down awkwardly on the safety play, as his left leg appeared to get caught under the tackler – Georgia Tech linebacker Brant Mitchell. The standout junior had to be helped off the field but would miss only one offensive series. Perkins engineered two lengthy touchdown drives in the first half, while true freshman backup Brennan Armstrong connected with Joe Reed on a 56-yard touchdown score as well to give the Cavaliers a 21-16 halftime lead. The UVA offense, which rolled on the three first-half scoring drives, sputtered to start the second-half. The Cavaliers punted on its only two possessions of the third quarter before putting together two game-tying drives in the fourth. The first – a 14-play, 70-yard drive – ended with a Delaney 30-yard field goal to tie the game at 24-24. Virginia settled for the field goal after Perkins heaved an incomplete pass to Reed in the end zone on 3rd-and-1 from the Tech 13. Trailing 27-24 with 1:04 remaining, Perkins led the Hoos on an 8-play, 52-yard drive that ended with a Delaney 32-yard field to tie the game at 27 apiece. 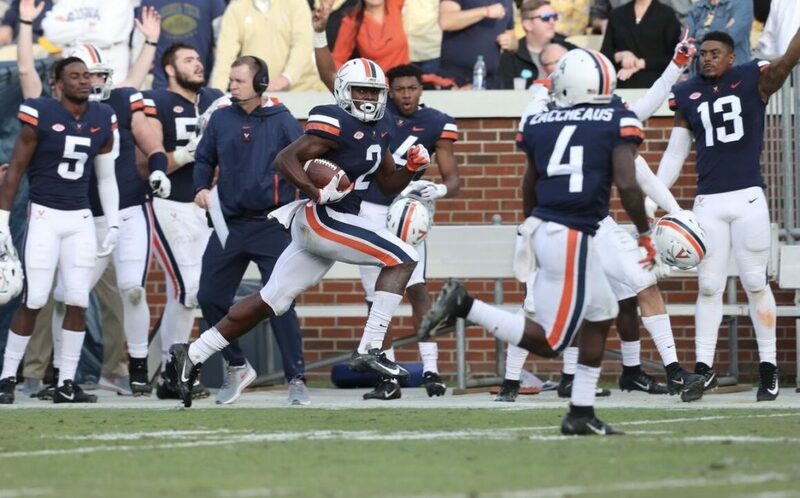 Although the Hoos secured the tie, there is the feeling of a missed opportunity after Perkins picked up 12 of his 73 yards rushing with a sprint to the Georgia Tech 9, giving his team a 1st-and-goal with 13 seconds left and the clock running. Perkins appeared set to spike the ball, but he faked it and rose up for a pass. In an apparent miscommunication the Cavalier receivers didn’t run any routes, and by the time Perkins’ pass landed out of bounds, only five seconds remained on the clock. “We thought we had just one opportunity, and we thought we might catch them sleeping,” Mendenhall said of the fake-spike play. Virginia’s defense stuffed Georgia Tech on the opening possession of overtime, forcing a field goal. Virginia’s final offensive possession ended with just six yards on three plays, setting up Delaney’s final field goal attempt, which sailed wide left. Perkins completed 21-of-26 passes for 217 yards and a touchdown for the now 7-4 Hoos. He added a rushing score as well. Senior Olamide Zaccheaus had 11 receptions for 111 yards while Reed (two catches, 78 yards) and Hasise Dubios (five catches, 46 yards) each had a touchdown catch. Senior running back Jordan Ellis managed only 33 yards on 12 carries as Georgia Tech, which improved to 7-4, consistently clogged up the inside lanes. Virginia managed 130 yards rushing in total. Georgia natives Jordan Mack and Rob Snyder led the Cavalier defense in tackles with 12 and 11, respectively. Junior Eli Hanback came up with a big game at nose tackle with eight tackles, including five solo efforts, while senior safety Juan Thornhill chipped in nine tackles, including five solo efforts. Following a game in which Virginia easily played well enough to win but didn’t, the Cavaliers take to the road next Friday looking to secure an 8-win season while also looking to accomplish another one of its preseason goals. “Beat Tech” has been a mantra for this Cavalier team since the preseason. – I thought Brennan Armstrong showed excellent poise and confidence during his only series of the game. He converted two 3rd downs on the drive, rushing 11 yards to convert a 3rd and 9 and then throwing the 56-yard touchdown pass to Reed. Coach Mendenhall indicated prior to this game that he wants to preserve Armstrong’s redshirt. Armstrong has now played in three games. – Virginia started true freshman Grant Misch and grad transfer Dylan Thompson at defensive end and Eli Hanback. Misch, who had not played before this game, finished with one solo tackle while Thompson was credited with six tackles (two solo) and had at least one crushing hit on Georgia Tech backup QB Tobias Oliver. Tommy Christ played well on the line in a reserve role, picking up the first sack of his career and totaling three tackles. True freshman Aaron Faumui played sparingly but played well when in there, coming away with a solo tackle. – Speaking of Oliver, UVA safety Brenton Nelson threw the redshirt freshman signal caller for a 3-yard loss on 3rd-and-2 from the Virginia 7, forcing a Georgia Tech field goal. An excellent play regardless, but some nice redemption for the 2017 ACC Defensive Rookie of the Year as a few plays earlier Oliver plowed over Nelson on an up-the-middle run and taunted him afterward. Nelson returned some trash talk of his own following the stop on third down. – While sophomore Zane Zandier has played well this season, Virginia went with Jordan Mack and Rob Snyder as its inside linebackers for the Georgia Tech game. – Brian Delaney is 11-of-14 on field goals after going 2-of-3 against GT. All three of his misses – two versus Duke and the overtime miss versus GT – have come from the right hash mark. Let’s hope this isn’t creeping into his mind. Delaney has been virtually automatic from the left hash. – I love the fearlessness Joe Reed ran with on the kickoff return that started off Virginia’s game-tying drive with 1:04 left in regulation. Ran with a full head-of-steam and no hesitation. The 34-yard return set up the Hoos with great field position. – He hasn’t played all season long after suffering a preseason injury, but redshirt freshman center Tyler Fannin was suited up against Georgia Tech. The Georgia native did not play. I was very proud of the Hoos’ effort yesterday, and they looked very well-coached against that tricky offense, especially considering how much inexperience we had to put on the field on the D-line.